Kathleen Kenyon had an earlier start to archaeology than most. Her father, Sir Frederic Kenyon was the director of the British Museum. British Museum. Born January 5th, 1906, she was the eldest daughter and set a good example for the rest. Kathleen attended Somerville College in Oxford and eventually became the first female president of the Oxford Archaeological Society, a very high honor. However, Kathleen was not interested in archaeology until she attended her first excavation as a photographer for the excavation of Zimbabwe. After this excavation, Kathleen decided she wanted to pursue a degree in archaeology, and form then on out she was fixated on the field. After Kathleen's start in archaeology and graduation, she joined forces with Sir Mortimer Wheeler. After working with Sir Wheeler and learning his techniques such as stratigraphy, she moved on to other excavations that eventually lead her to her most famous excavation: Jericho. Image 1 - Kenyon on site. Kathleen gained a lot of experience in the field and the classroom prior to her famous Jericho excavation. Shortly after working with Sir Wheeler, she joined the Samaria excavation in 1931. This excavation was of the Jewry Wall and is considered one of Kathleen's most important early excavations as the findings were of the Roman Empire and their architecture. After the Jewry Wall excavation, and during World War II, Kathleen worked for Red Cross. Towards World War II's ending, in 1935, she became a known lecturer and teacher at the University of London Institute of Archaeology. Kathleen stayed at the Institute until 1962. In this time between 1935 and 1962, Kenyon did her famous excavation of Jericho which led to the rest of her career's success. After leaving the London Institute of Archaeology, she became the principal of St. Hugh's College, Oxford. She served as principal from 1962 to 1973. In 1973, Kathleen was bestowed a great honor, becoming Dame of the British Empire. This honor was so great because most often it was essentially considered "female knighthood." 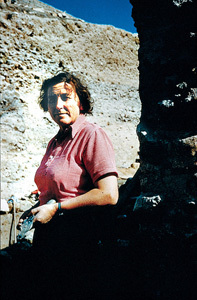 During this time, from 1951 to 1966, Kathleen was also awarded the position of director of the British School of Archaeology. This is where she really started to dig into researching, and from this position the world was granted the news of Jericho and its true age. Kathleen's excavation of Jericho is her most widely known and most famous excavation. She discovered Jericho's true age, but not without criticism along the way. Kathleen began her excavation and study of Jericho in 1952, nearly twenty years after a separate British excavation came to a close in 1934. The excavation in 1934 was done by John Garstang, and his findings and techniques are what lead Kathleen to be interested in Jericho. Arriving at Jericho in 1952, Kathleen did not plan to stay long, but soon found she had no other choice. Kathleen discovered pottery sherds, burned grains in jars, broken walls, destroyed towers, and much more which fed into her ultimate conclusion and discovery of Jericho. Along with her findings, her timely and controversial techniques of excavating via stratigraphy are what also led her to her findings that Jericho's downfall, and the biblical story that surrounds it, could not have happened as depicted. Kathleen believed that the city of Jericho was actually destroyed in 1550 BC opposed to 1400 BC that was believed prior to her excavation. Kathleen made this observation based on her detail to work, stratigraphy techniques, and pottery sherds. 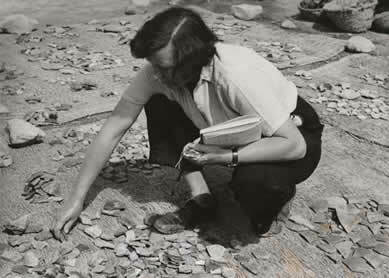 Kathleen was one of the first archaeologists to actually study the sherds instead of only the complete pieces of pottery. After her excavation at Jericho, Kathleen quickly became famous. She received numerous honors as shown in the career section above. While her findings were controversial in the religious community, they were hard to dispute. The excavation of Jericho is what led her to later excavate Jerusalem. Kathleen was not as successful at Jerusalem, however, the Jericho excavation is why Kathleen Kenyon will be remembered as one of the most influential archaeologists of all time. Although Kathleen had a very successful career, she did not have as exciting of a personal life. Kathleen never married and was known as having "three loves-archaeology, dogs and gin". That is not to say after she stopped excavating that her life was any less, or boring. She went on to write several books about her digs and about archaeology in general. After her digs she also continued to work in the archaeological community through teaching at university. Kathleen died August 24, 1978. After her passing she was stil praised for her findings at Jericho and her impact on the archaeology world. To this day she is still praised as one of the greats. Broshi, Magen. " Archaeology, Dogs and Gin: Dame Kathleen Kenyon, Digging Up the Holy Land." Bible History Daily. Biblical Archaeology Society , 21 Mar. 2012. Web. 8 Apr. 2016. "Dame Kathleen Kenyon." Encyclopaedia Britannica. Encyclopaedia Britannica, Inc/, 26 May 2014. Web. 10 Apr. 2016. "Kenyon's Excavation." Jericho. Vassar College, n.d. Web. 10 Apr. 2016. Koriech, Hana. "Beyond Jericho." Archaeology . Archaeological Institue of America, 18 June 2008. Web. 8 Apr. 2016. Pillars of Jerusalem Archaeology. 2004. BAS Library. Web. 10 Apr. 2016. Steiner, Margreet L. "Kathleen Kenyon and Jericho." Bible Odyssey. Society of Biblical Literature, n.d. Web. 8 Apr. 2016. Steiner, Margreet L. Kathleen Kenyon and Jericho. Private Collection. Web. 10 Apr. 2016.